One day you will speak and the jungle will listen. (SPOILERS) The unloved and neglected Jungle Book movie that wasn't Disney’s, Jungle Book: Origins was originally pegged for a 2016 release, before being pushed to last year, then this, and then offloaded by Warner Bros onto Netflix. During which time the title changed to Mowgli: Tales from the Jungle Book, then Mowgli, and finally Mowgli: Legend of the Jungle. The assumption is usually that the loser out of vying projects – and going from competing with a near $1bn grossing box office titan to effectively straight-to-video is the definition of a loser – is by its nature inferior, but Andy Serkis' movie is a much more interesting, nuanced affair than the Disney flick, which tried to serve too many masters and floundered with a finale that saw Mowgli celebrated for scorching the jungle. And yes, it’s darker too. But not grimdarker. Much of the conversation, when it hasn't related to the various release delays, or the reshoots (much of the ending was redone, and there was speculation as to whether Alfonso Cuaron's involvement was really a salvage operation on the scale of Tony Gilroy's for Rogue One), has focussed on the design aesthetic for the creatures. True, it's far from the photorealist naturalism of the Jon Favreau movie, the jungle inhabitants wearing clear traces of the performers playing/voicing them. However, while this was distracting in trailer form, where that's all you're able to take away, the choice quickly assimilates with the broader style in context. As a consequence, it's unfair to simply dismiss the results as cruder (although admittedly, some designs, such as Kaa, aren't as effectively realised as others). More importantly, in terms of winning over the audience, almost all the characterisations and performances are more compelling than the Disney version (which isn't to say the rendering won't still be a deciding factor; the all-star cast doesn’t stand a hope of saving the abysmal visuals for the new BBC Watership Down). Rohan Chand is far and away the better Mowgli to Neel Sethi. You could tell Favreau was shooting around Sethi's limitations at times, but Chand delivers a full-blooded lead of dependable emotional range. Christian Bale's Bagheera – I'd like to hear how Bale's method approach went for this one – and particularly Benedict Cumberbatch's Shere Khan (who may be the king of the jungle, but he's a convincingly lame, battle damaged one) entirely won me over, the latter formidable in relaying the tiger's fearsomeness. I wasn't as persuaded by Serkis as Baloo (apparently, he took on the role after being unable to find the right actor), but the conflict between bear and panther over the latter ensuring Mowgli loses his bid to become a member of the wolf pack and thus keeps his promise to return to the man village is suitably rancorous. While Callie Kloves (her first screenplay credit) was free to ignore the 1967 Jungle Book template that at times negatively impinged on the Favreau film, she only goes so far in remaining faithful to the Rudyard Kipling stories. Perhaps the most notable area in which she remains true to Kipling, and thus breaks with what has now become "lore", is having Kaa as a benevolent character, here voiced by Cate Blanchett and seen as, effectively, the voice of wisdom in the jungle, foreseeing that Mowgli is needed for the realm it will become ("One day you will speak and the jungle will listen"). 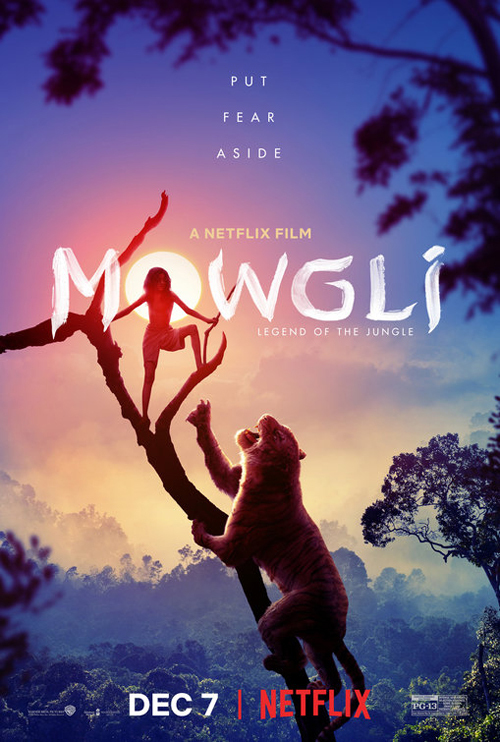 Indeed, some of the implicit messages here might be seen as on the suspect side – the subtitle is Legend of the Jungle, as if Mowgli is a Tarzan surrogate – since it concerns a human rising to – effectively – govern the animals, rather than co-exist among them, so importing the classic Hollywood device of destiny fulfilled. The threat of man, as exemplified by fire and the strict no-no of killing their cows, is emphasised throughout, but then sacrificed for something more dutiful and regimented, as Mowgli rides out of shot astride an elephant accompanied by Kaa's voiceover confirming his credentials ("Mowgli, man and wolf, both and neither, had given the jungle a voice and for as long as he stood watch over it, it would speak a lasting peace"). The text is such that Mowgli, with a foot between both worlds, is ideally placed to guide the lesser beasts through the (eco) challenges ahead (although, one might suggest Bagheera, with his history of captivity, has a similar pedigree); in the stories, the character yo-yos between village and jungle life, but he seems fairly rooted to the latter come the credits here. It's in keeping that Mowgli's rise to "rule" is hard won; Serkis ensures that even where Mowgli is welcomed, the environment isn't simply a cosy one. His fellow wolf cubs call him a freak, and don't want him around. When he is first returned to his fellow humans, he is placed in a cage. While Freida Pinto's Messua is very nice to him, hunter John Lockwood (Matthew Rhys), who takes on something of the mentor role of Bagheera, is marked out as untrustworthy when it is revealed he killed Mowgli's albino cub friend and fellow freak Bhoot (Louis Ashbourne Serkis). Indeed, there's something despairingly reminiscent of The Plague Dogs about Bhoot’s life and unhappy fate, definitely a movie you should be think twice about trying to replicate tonally. Other points of difference to the Disney telling include a more fleeting role for the monkeys and a much more significant one for the wolf pack. And, as noted above, there's the way Mowgli lives in the man village for a while before returning to the jungle to sort out Shere Khan. Structurally, this can't help but create issues the more streamlined Disney narratives avoided. It isn't so much that Mowgli feels episodic – that's in the nature of the original stories – but that it's more wayward than it probably should be, the sense of impending threat broken by the spell in the village. On the other hand, at least they actually went there; in the live action Disney version, the closest he gets is to steal a torch of man's red flower. I wasn’t really clear why the bull elephant would be persuaded to help Mowgli in return for his tusk, unless he has a bucket of superglue handy, but the climax is a suitably dramatic affair – I liked Mowgli's magnanimous "Sleep now, Shere Khan. Be angry no more" after knifing him – and in the passing of wolf pack leader Akela (Peter Mullan) quite moving. Indeed, of all the characters here, I found Akela the most affecting, going from staunch defender to banishing Mowgli for breaking the jungle code when he uses fire to save him (at least he didn't burn the entire place down) to final reconciliation ("It is your time now. Forgive me for doubting you, Mowgli"). Most of that can be put down to Mullan. If Mowgli: Legend of the Jungle sounds like a grim-faced affair, it is rather, and that might be seen as its main flaw, particularly for material traditionally embraced as family friendly. Even Tom Hollander's more humorously toned hyena Tabaqui is a twisted, unpleasant creation, although he gets some of the best lines, ranging from the positively poetic (discussing fire, he notes "It's hotter than the sun, and it’s quicker than the panther") to the existentially defeatist ("Sometimes, I dream I'm a tiger. But I always wake up a hyena"). However, I'd argue there’s room for this gnarly iteration, and that it offers rewards the playing-it-safe Favreau picture simply lacks. I think we’re in china, so to speak. Mountains are old, but they're still green. You counselled him and then he shot himself. It’s okay, Joe. It’s okay.